Dollywood, Dolly Parton’s Pigeon Forge amusement park, is growing. 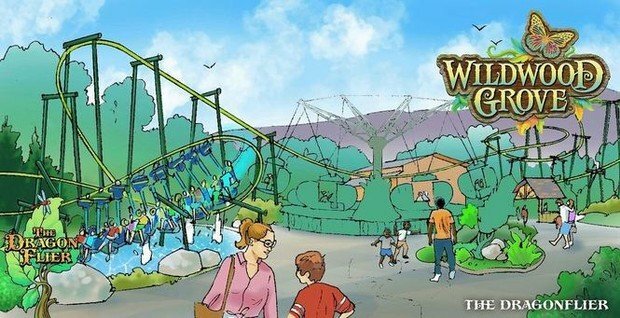 The expansion, the largest in the park’s 33 year history, will be called “Wildwood Grove.” It is set to open in 2019, the company announced. The new land will feature 11 new attractions, including six new rides, highlighted by a suspended roller coaster called the Dragonflier. In a press release, the park said the $37 million expansion allows Dollywood to meet its 2013 commitment of $300 million in investments over a 10 year period four years ahead of schedule. The new park is designed to bring families together in a whimsical, magical setting, Parton said. The Dragonflier– A suspended roller coaster lets guests soar with a dragonfly as it dips and darts along the gushing geysers and lush landscape of Wildwood Grove. Black Bear Trail– Hop on the back of friendly “bears” for a trek through their natural habitat. Sycamore Swing– Guests aboard this “leaf boat” swing back and forth just like a leaf falling from a giant sycamore tree. Treetop Tower– This family tower gives guests a sky-high view of Wildwood Grove as they soar nearly 40 feet in the air. Riders, seated inside giant acorns, spin around the top of a tall oak tree before gently drifting back to the grove floor. The Mad Mockingbird– Tennessee’s state bird–the mockingbird–gives visitors a lift as it flies in a high speed circle around a tall tree. Riders control their ride experience by moving a sail as the birds rush above the ground. Frogs and Fireflies–Frogs hop up and down as they chase each other around the lily pad trying to catch the flickering fireflies fluttering from the tall reeds and grasses. Adventurous guests can hop aboard for this riveting race. Guests can also enjoy Hidden Hollow, a 4,000 square foot indoor play space, and Wildwood Creek, a splash area with pop jets and wading pools, and a new restaurant. OLDER POSTHawaii Vacations – Is a Cruise the Best Way to Experience Hawaii?